A misaligned bite, also called malocclusion, can present several problems. Teeth that are not properly aligned can lead to uneven bite tension, excessive tooth wear, and even neuromuscular issues such as TMJ (temporomandibular joint disorder). In addition, crooked teeth can detract from the appearance of your smile. Although treating misaligned teeth is important for both health and aesthetic reasons, most adults are reluctant to have traditional braces placed. Luckily, there is an alternative that is just as effective but much more convenient. We are pleased to offer Invisalign, the most popular adult orthodontic option available. If you are interested in correcting your crooked teeth, call Cosmetic & Esthetic Dentistry today at 781-396-8558 to schedule your consultation. LVI-trained cosmetic dentist Dr. Ryan Clancy will be happy to examine your teeth and let you know if you are a good candidate for Invisalign. Invisalign is a popular alternative to traditional braces for older teens and adults. 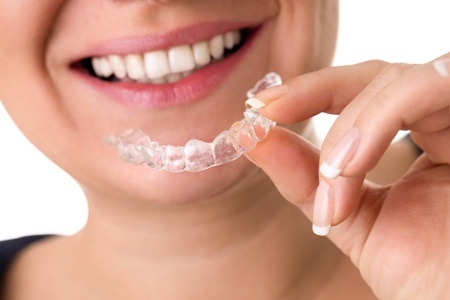 Instead of highly visible metal brackets and wires that can trap food and stain the teeth, Invisalign consists of a series of transparent plastic trays that slowly straighten the teeth. These transparent trays are relatively comfortable, and are practically invisible to others. You won't need to feel self-conscious about needing braces as an adult, as hardly anyone will even be able to tell you're wearing Invisalign trays. The trays are custom-designed to slowly move your teeth into place over the course of several months. Each patient will be different, but in general, you can expect Invisalign treatment to last for around 6 to 12 months. This is a shorter time frame than most traditional braces take, making it a convenient option for busy adults. An in-person evaluation will be needed to see if you will benefit from Invisalign treatment. If your malocclusion is extremely severe or complex, you may need traditional braces. On the other hand, if your teeth are only mildly crooked, you may want to consider porcelain veneers instead. Dr. Clancy has years of experience treating patients who want a straighter smile, and will be able to tell you if your particular issues would benefit from Invisalign treatment. Since Invisalign trays are removable, they are more hygienic and do not require dietary restrictions. Simply take them off to eat, then put them back on. We recommend brushing your teeth before putting the trays back on, though, to prevent food particles from becoming trapped in the trays. Removing the trays for brushing and flossing is also much easier than trying to clean your teeth thoroughly while navigating around braces. One of the major problems with traditional braces is the tendency for food to become trapped in the brackets, leading to staining and even possibly decay. With Invisalign, it is much easier to maintain good oral hygiene. If you have gum disease or cavities, these will need to be treated before you can embark on Invisalign treatment. In addition, if you are a smoker, we highly recommend that you quit or drastically cut down the number of cigarettes you smoke before using Invisalign aligners. Smoking can lead to discoloration of the trays, and if any tobacco gets caught in the trays, it's bad news for your teeth. Taking the trays off to smoke multiple times a day is not recommended. Plus, smoking is a leading cause of oral cancer, which can lead to much worse problems than simply crooked teeth. The cost of Invisalign will depend on the number of trays you need and the complexity of your malocclusion. Each patient will be different, so we won't know the total cost until after Dr. Clancy has examined you and recommended a full treatment plan. That being said, there is a misconception that Invisalign is more expensive than traditional braces. This is not always true. In fact, Invisalign and braces often cost approximately the same amount. Which one you choose should be based on your needs and which will accomplish your desired results better, not on price. We want all of our patients to be able to have the best dental treatment, which is why we offer dental financing plans for any patient who would prefer to pay in installments rather than upfront. Our patient coordinator will explain our financing options to you after your consultation if you so desire. We also accept cash, check, and credit card. We are proud to be able to say that Dr. Clancy is an Invisalign Preferred Provider. This distinction is bestowed on dentists who not only have completed Invisalign's advanced training course, but also perform a significant amount of Invisalign treatments throughout the year. Dr. Clancy has performed many successful Invisalign treatments, and has the experience necessary to create custom treatment plans that lead to beautiful outcomes. He is also able to tell if you are not a good Invisalign candidate, and will let you know if he thinks a different treatment would benefit you more. Dr. Clancy has been straightening patients' teeth with Invisalign for over 15 years, and is well aware of both the importance of being a good candidate for the treatment and how to prevent issues such as sleep apnea and TMJ. These conditions can arise from improper Invisalign use, when a dentist does not take the time to carefully consider the entire jaw when creating a treatment plan. Dr. Clancy will only perform Invisalign if he thinks that you will benefit from it with no side effects. If you are ready to take the first step towards a straighter, more beautiful smile, call us today at 781-396-8558. We serve patients in Winchester, Somerville, Cambridge, Medford, and Boston, MA. Copyright © Cosmetic & Esthetic Dentistry. All rights reserved. Website Designed, Developed, and Optimized by Page 1 Solutions, LLC. Disclaimer: The information throughout this dentistry website is not intended to be taken as medical advice. The information provided by Cosmetic & Esthetic Dentistry - Dr. Ryan Clancy is intended to provide general information regarding cosmetic dentistry including porcelain veneers, smile makeovers, teeth whitening, and dental bonding, Invisalign, TMJ treatment for headaches, jaw popping, and neck pain, dental implants, sleep apnea treatment, sedation dentistry, general dentistry including routine cleanings, and more for residents of Boston, Medford, Winchester, Cambridge, Peabody, Somerville, and nearby areas of MA. This website is not intended for viewing or usage by European Union citizens. If you are interested in finding out more, please contact our dental clinic today for a personal consultation. Read our ADA compliance disclosure.